March is literacy month, and now is a good time to think about different ways we can help to encourage our kids to love reading. Even though we might think we are helping to raise little literacy buffs, here are a few extra ideas. 1. Read Everywhere. Sometimes we only think about reading a book with the kids when it is time to settle down and go to bed … the old book at bedtime routine. Keep books in different parts of the house, like the kitchen and family room so it will be a nautual occurence to just pickup a book. Keep a few books in the car. 2. Find books that interest your child. It might sound like commons sense, but if your child has a speical interest, such as elephants or tigers, find some books with that theme. He will be more inclined to read and re-read those books. 3. 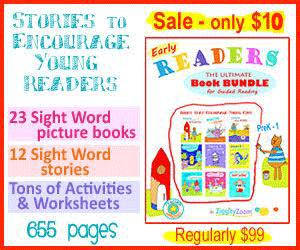 Read at your child’s pace. Occasionally a child just wants to flip the pages back and forth to see what already happened in a story. Don’t discourage this. Let your child explore the book as you, or he, are reading. It will be much more enjoyable to him and more memorable than if you control the experience. 4. Encourage Storytelling. Make a fun activity out of making up stories. See who wants to start the story and then take turns adding to the adventure. Kids love this and it helps them to relate to stories in books. 5. Ask to be read to. Whether you have a child who can already read or is just learning, ask them to read to you. If a child doesn’t read yet, let him flip through the pages and make us the story as he sees it. 6. Read digital books. With so many opportunities today to read books, both online and on devices such as the iPad, Nook or Kindle, take advantage of the many books at your fingertips. It is so easy to find a new book in this way. Remember to let kids help find books that sound fun to them also.